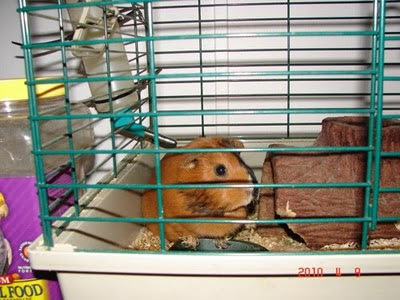 It's been a long time since I played Camera Critters.. but last week Gina my amazing guinea pig passed away. So goodbye to her. She was a good little guinea pig.. I'm very sorry about Gina, that certainly wasn't a nice thing to have to come home to. What a cutie Gina was. I read your previous post, too. I tried for 20 years to quit smoking, and the last time I tried to quit, my wonderful, sweet, lovable and loving cat Hermie died of a brain tumor. I don't know if his tumor was related to my smoking, but even the pain of his death wouldn't make me start again. Wishing you a happy road to recovery. I'm so sorry about Gina! This is my first time visiting your blog (via Camera Critters). We have two guinea pigs ourselves -- Magic and Muffin -- and they are such cute little things -- well, ok, not so little, especially Muffin who seems to think eating is required on an hourly basis :-) But we are very attached to them and having lost pets previously I know how hard that is. They are family after all! Sending many good thoughts and prayers from all of us here -- human and furry alike! What a cute guinea pig! Hes saying I want a bigger room look at all that space out their and what I could do.